I’m still working away on that last-minute costume. I got so caught up in the process that I stayed up until almost 2:00am without even realizing it! I had absolutely no intention of staying up too late. When I get into problem-solving mode, I hate to stop when I’m on a roll. If I’d been super-frustrated, I would probably have stopped earlier (although there was a large seam that I “sewed” without realizing that the bobbin had run out). 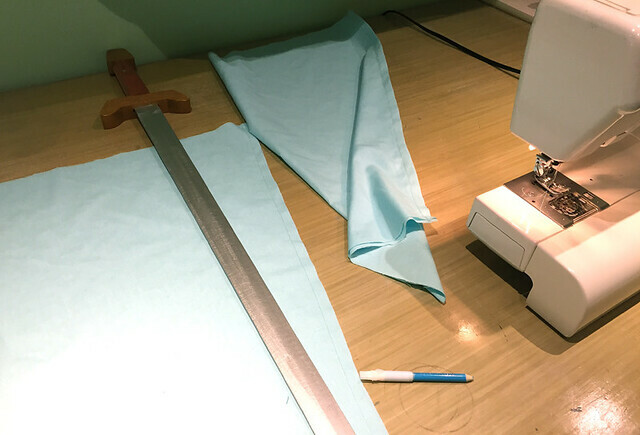 I couldn’t find my meter stick, so I did end up using a wooden prop sword in order to trace a long, straight line on my fabric. My father pointed out afterward that I could have just called and borrowed his, but the sword was only a few feet away from where I was sewing, and it worked out fine! November 15th is Clean Out Your Refrigerator Day, so I made a dinner entirely out of what I had around the house. This had nothing to do with the fact that I’ve been so engrossed in costume construction that I haven’t gone out to do groceries, I swear. I went with one of the simplest clean-out-the-fridge dishes: stir fry. 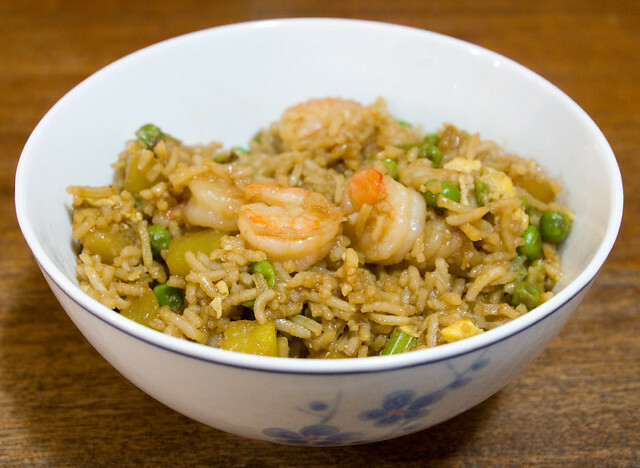 I cooked up the veggies I had on hand (celery, zucchini, and frozen peas), scrambled in some egg, threw in some cooked rice and shrimp, and gave it all a good drizzle of sesame oil and soy sauce while I cooked it all together for a few minutes. My husband asked for seconds, which I figure means it wasn’t half bad. After the kids went to bed, I wanted to treat myself to some banana bread, which is pretty much my favourite quick bread. I even had some bananas I’d frozen before they went bad that I needed to use up, so the timing was perfect. I’d seen a Tasty video for 6 Desserts To Make In Your Microwave, so I thought I’d give their individual microwave banana bread a shot. Sadly, as with the microwave oatmeal bread I made a while back, I was disappointed. 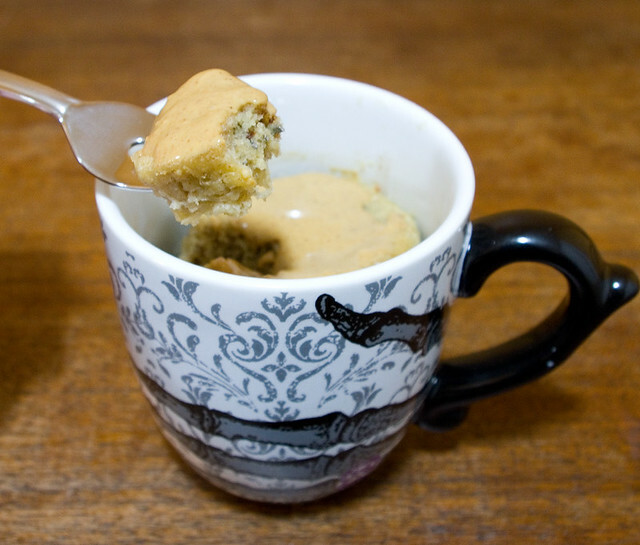 The more I try it, the less I think that microwaves can be used for half-decent baking. First of all, there was a recipe in the YouTube transcription of the recipe. If you watch the video, the ingredients include 3 Tbsp brown sugar and 1/2 tsp baking powder, but the recipe under the video calls for 3 Tbsp brown sugar and then another 1/2 tsp brown sugar, with no baking powder. Luckily I noticed that there was no rising agent before I started cooking, but by then I’d already added the extra 1/2 tsp brown sugar, too. Once the banana bread was cooked, I found it to be largely tasteless. I found that interesting, because it contains basically the same ingredients as the more traditional banana bread in the Joy of Cooking; what really differentiates the two, other than size, is the cooking method. I think that because the Tasty version is made so quickly in the microwave, instead of cooking for an hour or more in the oven, it doesn’t have a chance to develop its flavour, which probably mostly comes from the crust. Microwave cooking, in general, doesn’t create proper crusts. Also, I found the consistency of the microwave banana bread to be less like a quick bread and more like a sponge or a pudding. I cooked it for an extra 30 seconds over the recommended time and tested it with a cake tester for doneness, so I know it was definitely cooked all the way through. Even so, the consistency was more like microwave scrambled eggs than like bread. Of course, opinions may vary, and you may like banana bread made this way. I think that I will stick to baking in the oven from now on, except perhaps for the occasional experiment. Posted on November 16, 2017 November 16, 2017 by owntwohandsblogPosted in Cooking, Costumes, sewingTagged baking, Cooking, cosplay, costume, Costumes, costuming, dessert, dinner, food, microwave, quick breads, sewing, stir fry, supper.